There are several kinds of sugar in our diet. Two primary sugars are glucose and fructose. Table sugar is a 50/50 split of glucose and fructose. The evil high fructose corn syrup shifts the mix to 55% fructose and 45% glucose. This small change makes a big impact where it matters: in our brain and around our middle. Dr. Robert Sherwin is an endocrinologist at Yale University. He wanted to study the effect of high fructose corn syrup on the brain. He did this by rounding up 20 young, healthy people and studying their brain activity as they drank beverages with and without high fructose corn syrup. Since he couldn’t saw open their skulls and watch, he used the next best thing: a magnetic resonance imaging (MRI) device. This gadget tracked the flow of blood through various regions of the brain as it reacted to drinking the beverage. During one session, the volunteers drank a beverage containing glucose. Several weeks later they drank a similar beverage, but containing fructose instead. During both visits their brain activity was monitored with the MRI device. The MRI scans showed that the area of the brain responsible for feeling hunger was suppressed after drinking a beverage containing glucose. This made sense, because the sweet beverage should satisfy your hunger. 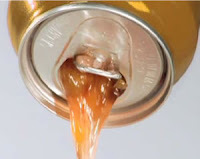 However, that area of the brain was not suppressed after drinking a beverage containing fructose. That means that beverages that contain fructose can actually mask the feeling of being full, causing you to eat more than you would without the fructose! By reducing your intake of fructose, you are more likely to feel full more quickly and perform that most vital of all exercises: pushing away from the dinner table. Give it a try! You might just find that your diet is a whole lot easier to follow without a brain full of fructose.